This is a Clock Alarm System for the Raspberry Pi. It has sunrise lighting, coffee machine control, physical snooze button, and an Android companion app. LightUpPi Alarm: The Alarm system running on a Raspberry Pi. It controls all the hardware triggered for the alarm alert, and provides multiple ways to interface with the system (command line, web front and server back-end). 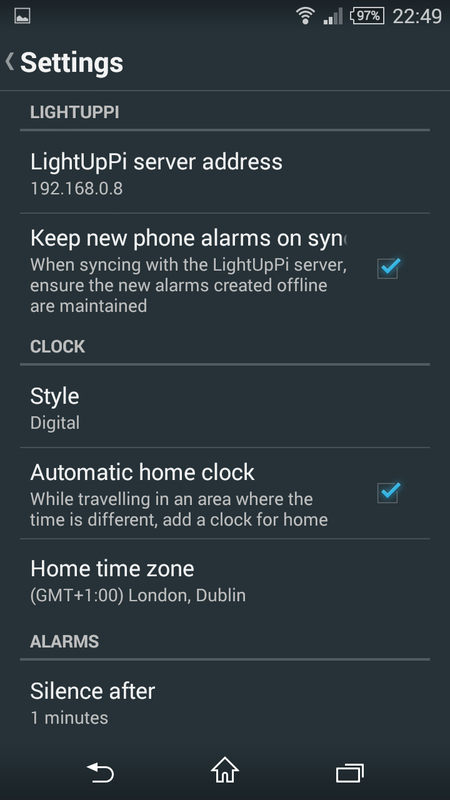 LightUpDroid Alarm: An Android alarm application that connects to the LightUpPi Alarm server to synchronise phone alarms. It is capable to keep and trigger its local alarms without a connection to the LightUpPi Alarm system. LightUpAlarm: Completely independent Python package to manage alarms (create, edit, and delete Alarms; can execute a callback function on alarm alert). LightUpHardware: Controls external hardware to complement the alarm alert, in this case it controls the room lights, mains socket switch, and snooze functionality from a physical button. LightUpServer: Creates an HTTP server to interface with the LightUpAlarm system using a web interface or JSON (used in the LightUpDroid Android app). LightUpWeb: Front-end web interface for the LightUpServer. This application has been been develop to run a Raspberry Pi with Python 2.7. The project currently aims to maintain compatibility with Python 3. You can see the project Python dependencies on the requirements.txt file. Note that the LightUpAlarm package can be used independently as an alarm system software and does not require any additional hardware to run. Instructions about how to use the CLI can be found in the LightUpAlarm package README. And then pointing your browser to the following adddress: http://<raspberrypi_ip>/LightUpPi. 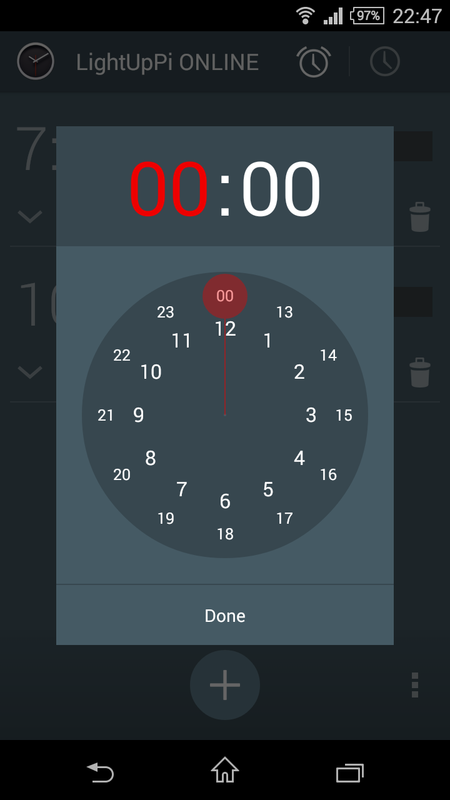 This is an Android companion app for the LightUpPi Alarm. 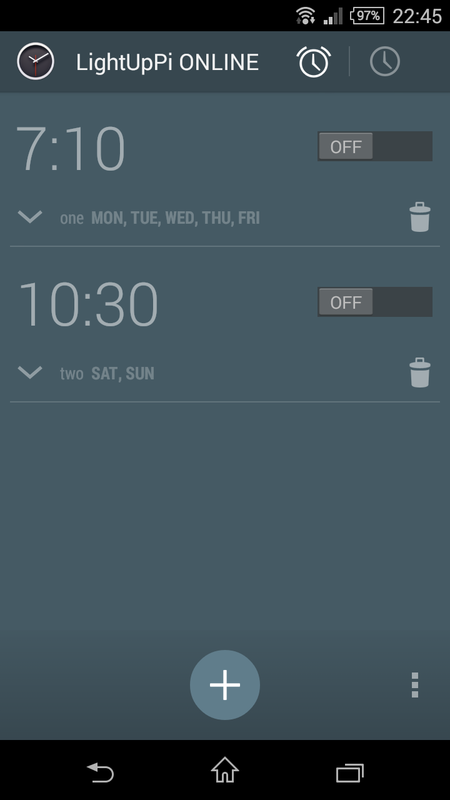 It is an Android alarm app that synchronizes to the alarms running in the LightUpPi Alarm Raspberry Pi system. 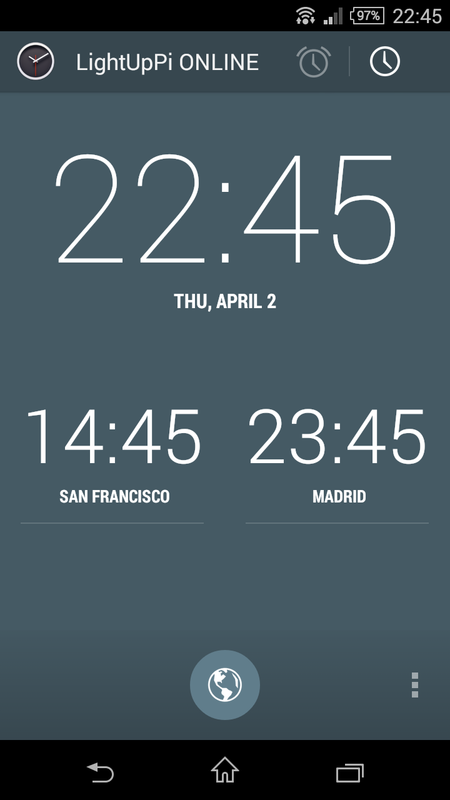 It is based on the Alarm Clock app by Jacob Klinker, which in turn is a modification of the official Android Open Source Project DeskClock (updated for backwards compatibility). This project is licensed under The MIT License (MIT), a copy of which can be found in the LICENSE file.